We do everything on our smartphones — text our spouses, FaceTime our kids when we’re away on business trips, pay our bills, and buy our moms’ birthday presents at the last minute (thank God for next-day shipping!). With so much of our lives playing out on our phones, it’s only natural that we would shop on them as well. Mobile shopping, or mCommerce, now accounts for more than half of all online sales, and businesses that don’t accommodate this trend stand to lose billions in revenue. Despite the popularity of mCommerce, however, many companies fail to reach consumers on mobile. Instead, they invest in desktop even though the platform’s prominence is waning. Mobile commerce is outpacing desktop commerce by a factor of 3x, yet the opportunity on mobile is under-leveraged. That’s detrimental for two reasons. The first is that it’s a losing strategy for connecting with customers. If people want to shop through mobile apps, you need to give them a mobile app – or at least partner with a company that can provide mobile access to your products. The second problem is that companies that don’t optimize for mobile don’t get found. In November 2016, Google announced that it’s moving toward mobile-first search indexing. Businesses that don’t have a mobile-specific strategy will fail to rank well on Google, which is a death sentence for retailers in our mobile-centric era. The most important question you can ask of your company right now is, “Are we failing at mCommerce?” If you’re not sure of the answer, here are some common problems — and fixes — that will help you assess your mCommerce presence. Sites that look unprofessional create a sense of distrust, and those that don’t read well on mobile spark outright fury. Consumers are accustomed to using their phones to conduct business and buy their groceries. They don’t have time to scroll through an awkwardly laid out site that looks terrible on their smartphone screens. Fortunately, you don’t need to shell out tens of thousands of dollars to revamp your web presence. Platforms such as Squarespace, WordPress, and Wix enable you to use free or low-cost templates that include responsive design. They’ll re-order page elements instantly depending on what type of device viewers are using. Having a mobile-friendly site is the bare minimum for a smart mCommerce strategy. Once that’s in place, it’s time to consider your app presence. Apps open the door to a range of tools you can use to enhance your relationship with your audience. Push notifications, promotions based on geo-tracking, and augmented reality features all entice people to engage with your brand. They’re also great ways to gamify your loyalty rewards program, giving consumers even more reason to check in often. As with responsive sites, you don’t need to build an app from scratch. There are numerous online app makers that enable you to up your business’s mCommerce game quickly and without design expertise. App making programs offer the flexibility and affordability to boost engagement without breaking the bank. App Store Optimization (ASO) is critical to your mobile success. Before launching your app, spend time researching title options and keywords. Most people find new apps by in-store searches, so you want to know which terms will lead them to your offering. You can also advertise the app with a non-intrusive banner ad or a promotional code for first-time app users. Once you’re up and running, launch a marketing campaign specifically around the app. Let your audience know where to find you, what special features are included, and how they’ll benefit from using the app. Be sure to ask people to leave reviews as well, as these factor significantly into an app’s success. Let’s say you’ve done everything right so far. Your website is optimized for mobile, you launched an app, and you run an ongoing ASO campaign. But the app still isn’t gaining much traction, and most users haven’t been back since the initial download. In this case, there’s a good chance you’re not leveraging the app effectively. To stay top of mind, you need to remind people the app exists. Send a push notification inviting them to try out a new feature, send an email highlighting a particularly interesting use, or offer a discount the next time they make a purchase through the app. These are all great ways to generate traffic. Great content also inspires ongoing app use. Experiment with different formats, such as video, infographics, and articles. Give them a reason to check back regularly – you want them to be hooked on your content so they’ll use the app regularly and tell their friends to download it, too. People abandon their carts for a variety of reasons. They become distracted by other sites and apps, decide they don’t want the product after all, or get spooked by the final price. But these customers aren’t lost causes, in fact new app users are twice as likely to return to your store to complete their purchase within 30 days compared to mobile web users. You just need the right strategy for drawing them back. First, make sure your checkout process is simple and intuitive. People don’t want to jump through hoops to make a purchase. Integrate different payment systems and make the process as seamless as possible. After you’ve optimized your procedures, A/B test different methods of nudging customers toward checkout to compare conversion against different campaigns. 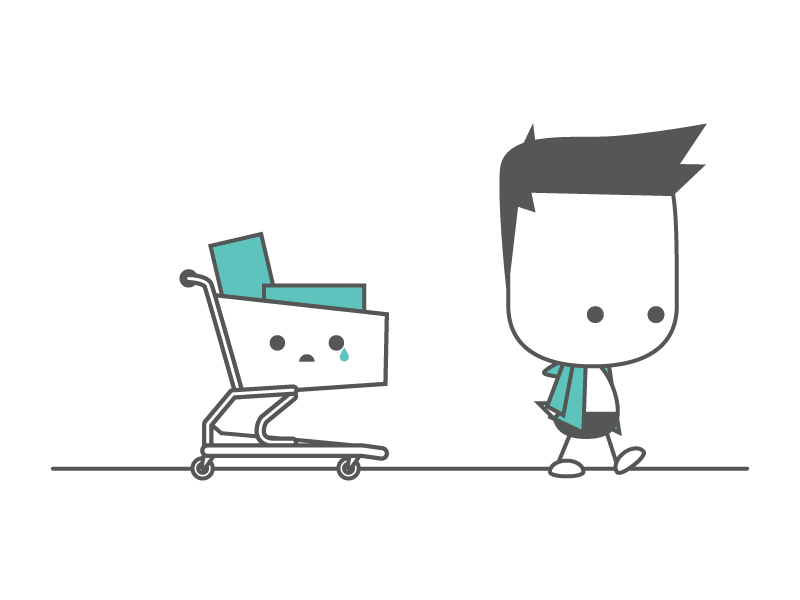 If someone has abandoned their cart, send a friendly email or push notification inviting them to complete the purchase. Often the best strategy may just be a simple in-app reminder or a notification to tell the user that cart items are low in stock. You may also want to sweeten the deal by including an exclusive promo code or offer free delivery if they complete the purchases within a 48hrs. Finally, include customer support in the form of live chats or a hotline that’s staffed by actual people. People want to buy from companies they trust, and nothing inspires trust like a reassuring voice on the other end of the line. If your mobile performance is lacking or you haven’t yet invested in mCommerce, now is the time to set that right. Mobile has changed the way consumers search and shop for products online so it’s essential for businesses to ensure their mobile journey provides a frictionless experience, from browsing products to checking out. Use the guidelines above to craft a user-friendly mobile experience that inspires people to buy from you again and again. Ian is the Founder and CEO of Appinstitute, one of the world's leading DIY app builders. Naylor has founded, grown and sold 4 successful internet and technology companies during the past 18 years around the world. An expert authority on mobile app trends, Ian is a regular speaker at numerous industry events. Appinstitute has been named in the top 50 creative companies in England by Creative England.